Okay, I know I’ve promised for a long time now that I would upload the missing pages for the movement and controls, but I think that it would be better if i gradually introduce these features over time, otherwise it could be information overload and promote a lot of questions and suggestions. In an email I responded to recently, I disclosed some information regarding weapons and how you will be able to control your arms. I think its only fair that I share these details here so you know what I have planned. I’ll also share some of my more elaborate ideas regarding alternative control methods. Please note that all this information and the posted images are WIP and not final. In-game testing will be needed to finalize anything. I want to portray Anne as a real person. She’s not a trained action hero, just a young women who has never even held a gun before. Anne’s first encounter with an aggressive dinosaur, will most likely be when she is armed with only a melee weapon. So when she finally acquires her first firearm, she will welcome it and actually want to know how to use it to protect herself. In many games, its just assumed that the lead character is experienced or trained in weapons handling. They’re always able to pick up a weapon and start using it like a professional, rarely questioning their actions. The first time Anne picks up a new firearm, she will inspect it and then attempt to turn off the safety, chamber a round and then fire it. The game will instruct you when to fire, and then after firing a few shots, you will be prompted to reload it. Anne will then fumble around with the gun, learning how to eject the magazine or discover how to load individual shells. These little automatic tutorials will take place every time Anne finds a new type of firearm, teaching both Anne and the player how to use them and how they behave. Like Trespasser, this game will not use a HUD to display health and ammunition levels. Players can check their current ammo level at any time, by quickly pressing R (tap it). This will see Anne removing the magazine, inspecting it, and then announcing how many shots are left, just as she did in Trespasser. For weapons that don’t use a magazine and have individual shells / bullets, she will simply look at the weapon and announce the remaining shots. To reload a weapon, simply hold down R. You can release it as soon as she starts to reload. Ammunition levels can also be checked in the inventory screen. This will also show how much ammunition you have in reserve for all your weapons. You will be able to equip a “compact” weapon as a primary and a larger rifle size weapon as a secondary. Your primary / compact weapon will be shoved into your belt / waistband and the larger rifle slung over your shoulder, like in the original game. These will be bound to the number keys 1 and 2. Pressing these keys will draw them and holster them. You will be able to hold more weapons in your inventory, but you will need to equip them before you can use them properly. The first time you pick up a compact weapon, it will be automatically equipped into your primary slot, the same for a larger rifle size weapon, it will automatically be equipped into your secondary slot. This is to simplify things for new players. When you pick up another weapon, you will be able to fire it, but you wont be able to reload it unless you equip it first. There are two ways to do this. Your inventory will have an image or a simple outline of Anne’s body (possibly even a 3D model), showing what she is currently holding in her hands, what is in her primary and secondary slots and what is in your bag / pockets (inventory). To equip a weapon that’s in your bag, you can click and drag it into a weapon slot, or if you’re actually holding it (will be shown in your hand), you can click and drag it from your hand to the weapon slot. It will remain in your hand, but it will now be equipped to that slot. You can’t equip a compact in the secondary slot or vice versa. A faster way to equip a weapon you have just picked up, is to hold down the appropriate number key to equip it. So if you pick up a compact, Hold Down 1 and it will automatically be equipped to that slot, same for a rifle, hold down 2. Now, because equipped weapons don’t take up space in your inventory, if you use the quick method to equip a weapon, but another weapon was already equipped that slot, it will be moved to the inventory to clear that slot for the new weapon. However, if your inventory is full, that old weapon will actually be dropped. It may be possible though to program it so that if its a handgun you’re replacing, instead of just dropping the old one, your left hand will simply draw it. Giving you the chance to use it first before discarding it. Now please ignore the following key bindings, they are just how i would set them up. You will be able to customize the controls to your liking. In Trespasser you could only control your right arm to pick up and use objects and items. You were able to fine tune your arms position and angle by adjusting the arm and wrists rotation, but this often lead to some unnatural angles, causing messy / glitchy behavior. You will be able to control both arms this time, not just one. The Right Mouse Button will allow you to control the Right arm, the ALT key for the Left arm. You can only control one at a time, unless your holding something with both hand’s, then either key will move both arms. This will function the same as it did in Trespasser, moving the mouse around will move your arms around and closer to objects, or allow you to aim/reposition items on screen. To actually grasp and pick up an object, press F when your hand is close enough to it. If you want to drop an object, press F again. If you want to put the object you’re holding away into your inventory, press E. Pressing E again will re-draw that object. If you want to Throw an object, Press Q. Holding down Q and then pulling the mouse backwards will allow you to adjust the power of your throw. This allows you to throw much more aggressively, effectively turning anything you can pick up into a ranged weapon. If you hold Q and move the mouse forwards, you can instead Place the object down. So rather than simply releasing it from your grip and letting it fall at your feet (F), you can walk up to a table and gently place it down, or crouch down and place it on the ground. This will create much less noise then simply dropping it or throwing it. The position of your arm/hand will make it easy to tell how hard your going to throw or how gently you will place it. Releasing Q will initiate the action. If you decide to not throw or place an item (you might be surprised by a close dinosaur and not want to risk making any noise), you can press E to cancel the command. Take Note: All these commands, (F, E and Q) will always apply to the Left hand first. This allows you to hold a gun in your Right hand and quickly interact with other objects with your Left hand. This also emphasizes the benefits of a smaller weapon, as you can’t use your Left hand if your holding a rifle. What about using two handguns at the same time? Sure. If you’re already holding a pistol in your Right hand, and want to hold another pistol in your Left hand, just use the ALT key and F to pick it up and then you can fire them at the same time. A limitation of using two handguns (although a realistic one), is that Anne needs both hands to reload a gun. This means you will only be able to reload the weapon that’s in your Right hand (providing its equipped of course). Holding R will cause Anne to either put what’s in your Left hand in the inventory, or to drop it if your inventory is full, so she can reload the gun in her Right hand. Also note; if the functions assigned to E (stow away and draw) always apply to the left hand first, this means that if you’re exploring while armed with a handgun in your right hand, whenever you pickup a handgun with your left hand and press E to stow it away in your inventory, you could then press E at any time time to re-draw it again with your left hand. I’m sure players will learn ways to reload two handguns more effectively, providing the controls are programmed accordingly. Theoretically, if you were holding two empty handguns you could press E to put the Left gun away into your inventory, then hold R to reload the Right gun. You could then press E to re-draw the (empty) Left gun, and then press 1 to holster the Right gun. THEN, you could hold down 1 and quickly equip the Left gun, allowing you then to reload it. Then you could then press E again and re-draw the Right gun. Its a little confusing, but i don’t see why it wouldn’t work and would provide a way to reload two handguns and make you work a bit more realistically to do it. The game is primarily an adventure game, so your ability and desire to use multiple weapons like an action hero, must be weighed up against the disadvantage of not being able to interact with the world or to reload easily. Now to keep fans of both Trespasser and traditional FPS games happy, i think a combination of both kinds of aiming should be provided. I think when you pick up a weapon, it should be positioned off to the side like it would in any other FPS, that way its not blocking your view and allows you to see more of the environment. If you use ALT or the Right Mouse Button to move your arm, you can then “free aim” and use the guns sights to aim. I think this provides a good balance between the two styles and by removing excessive controls like “rotate arm” and “rotate wrist” it eliminates all the wobbly arm issues and glitches. An option could be provided to toggle “always free aim”, so that the weapons position is always up to you, and will never return to the default on. You’ll also be able to choose which hand is your primary hand, for those who prefer their weapons on the left. Please don’t bombared me with questions regarding the above video, weapons position, designs etc. Its not my work and its in no way a reflection of what i have planned. Its just an example of a system that has both weapons to the side and also free aim. I have not really spoken about the LEAP Motion device, and how it could be used as a controller for this project, but I think its actually pretty self explanatory how it could be used. Whats not so obvious is what combination of other devices would you need to use for a complete setup and just how effective it could be. The LEAP Motion device would probably be quite easy to integrate into the control system, so that your hand and its motions can be used to pick up items, drop items, shoot weapons and aim. How well this device could handle multiple gestures is unknown, but it would be required to take on all the functions that the mouse is capable of performing, otherwise its an instant disadvantage. A mouse provides you with at least three buttons (+ scroll wheel) and also the motion. The LEAP would most likely be able to detect an open and closed hand for picking up and dropping, a trigger finger motion for shooting and moving your hand around to aim. The LEAP would need to be used in conjunction with a keyboard, so you could control your movement as well as other functions such as jump, duck, reload, etc. This setup means that you would most likely be operating from a desk, which places the LEAP in a position where your hands will be waving about in front of the screen, possibly limiting your view and the available space to move your hand around. Taking into consideration the devices operational field of view (fov), it would probably be set up to act as a thumbstick on a controller. So as you move your hand to the right, the screen moves to the right, the further from center you move, the faster the screen moves, not stopping till you center your hand again. I can see this becoming tiresome and not overly accurate or fast, particularly when compared to a mouse and keyboard setup. Another very important thing to consider, is that when using the LEAP in combination with a keyboard, your kind of limited to only using your right arm to control the LEAP. This would make it a bit tricky to control both arms in the game, even if the ALT key was used simply as a toggle between either arm. You would be controlling a visual representation of a left arm with your right arm and i think although you would eventually get the hang of it, its not an ideal setup. I like the LEAP, i think its a fantastic concept and will be amazing in certain situations, but it is in no way a stand alone replacement for a mouse, even when used in conjunction with a keyboard. I may be proved wrong here in a number of ways, but i think it will be difficult for it to match a multi-button mouse for speed, accuracy and capability. For those of you not familiar with the LEAP, check it out. Another alternative control method, which im extremely excited about and i think will be incredibly immersive, is the Oculus Rift. 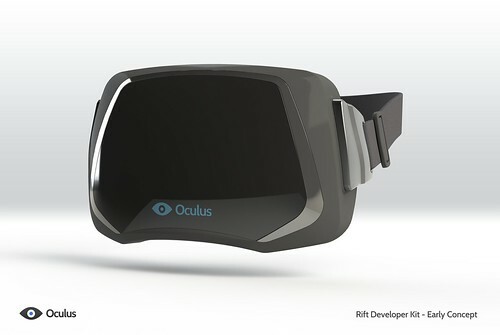 The Oculus Rift is a 3D virtual reality headset, that has motion tracking and a very wide field of view. Unlike some headsets that use small displays and a narrow field of view, that gives the impression the displays are a metre or so away from you, the Oculus Rift has an amazing 90 degrees of horizontal and 110 degrees of vertical field of view. This means that when you look around inside the headset, you can only see screen and nothing else. Each eye is given its own 640×800 display, which equates to a combined resolution of 1280×800. This may sound low res compared to what we are capable of running today, but there are several factors to consider. The first is that this device is in its infancy and the specs may change to include higher resolution displays before its commercial release. The lenses used to provide the wide field of view, causes some distortion that must be corrected, and this eats up computational power. The low latency required for such accurate and fast head tracking, may also be a factor, so a higher resolution may result in delays when you look around. I suggest you watch this interview with id Software’s John Carmack, as he explains the modifications and tests he performed on the headset as well as some from other manufacturers. When used in combination with the LEAP, the Oculus Rift would provide a not only a very immersive experience, but it would also free up a few tasks from the LEAP. Using the Rift’s head tracking for looking around instead of your hand, means you could use the LEAP to constantly track your arms position independently of where you are looking, for truly free aim and control over Anne’s arm. A hot key could then be used to enable an alternative set of LEAP controls via hand motions and gestures to control weapon switching, strafing, jumping, ducking, or anything else you would prefer to control with your hand instead of the keyboard. You could have always allowed an alternative set of gestures, but the Rift allows you to keep looking around while you do other things with your hand. I can imagine this would look pretty darn cool, looking down and seeing your body and your arm moving around in real time, holding a gun or picking up objects. This type of setup could be used for real time hand gestures for communicating with others, or for just giving a raptor the finger.. 🙂 Unfortunately, its still limited to just one arm at a time, which although is no more limited than a mouse + keyboard setup, it does raise the question of why you cant just use your other arm. You would be able to see it there, dangling at your side, but not be able to use it. You also have to consider the position of the LEAP and if it would allow you to track the position of your hand over a wide area. Would you be able to set it on the ground in front of you so it could track your hand from your side to above your head and out to the side? If the LEAP was capable of that much coverage and could also track both hands, you might be able to develop a new set of gestures that allowed complete control of the game using just your hands. I imagine it could be done, but i doubt very much if it would be as fast, accurate or user friendly as a mouse + keyboard, considering the amount of controls most first person games have these days. Its certainly a nice alternative control method, and would provide a definite step up in immersion, but i can think of a better setup. When i first had ideas for this project back in 2007, i thought a Homebrew Nintendo Wii port of Trespasser would be really nice. The Wiimote would provide a fresh control experience for throwing objects, aiming weapons, etc, and the engine could definitely be optimized and ported if the source code could be obtained. Now that the Trespasser source code has been discovered, it means ideas like this are a real possibility, but for some time now its been possible to control PC games using a Wiimote, so the easier and obvious solution is to just integrate Wiimote support into the Trespasser engine. There are a few people working with the Trespasser source, but most of this is cleaning up the code and enabling some previously disabled features and effects. Hopefully one day they will get it to the point where its fully hardware accelerated and can take advantage of modern hardware, including devices like the Rift, Leap and the Wiimote. CryTek are not yet listed among the developers that are supporting the Rift. Hopefully they will get on board sometime soon, otherwise it could make integration into the engine almost impossible without access to the engine source. It would be nice if they provided support for both Cryengine 2 and 3, otherwise i’ll be left with no choice but to port the project to CE3. I have not yet done any serious testing with the Wiimote on my PC, i’m just charging my controlers now so i can have a play this afternoon. I have spent plenty of time theorizing their use though, and i think the Wiimote + Rift combo would provide an amazing experience. The movement of both the Wiimote and the Nunchuk can be monitored, but i think the Wiimote is probably more accurate and able to be tracked over a wider range of motions because of the sensor bar. If the tracking accuracy of the Nunchuk is good enough, then there is the potential to control both of Anne’s arms independently at the same time. The Nunchuck has an analogue thumbstick that can replace WSAD and it has two triggers, which could be used for shooting and interaction with your left hand. The trigger on the Wiimote and the A button can be used for your right hand. Motion gestures can be used for certain commands and the remaining buttons cover pretty much everything else. Run: While pressing up on the thumbstick, shake the controllers up and down rapidly, as if you were running. Melee attacks: Swing the appropriate controller to use what your holding as a melee weapon. Throw: Hold down the throw / place button for the appropriate hand and then move the controller to adjust your throw. Then release. Place: Hold down the place / throw button for the appropriate hand and then move the controller to adjust your hands position. Then release. Pick up: Use appropriate controller to position hand, and press button to grasp object. Drop: Press button on the appropriate controller to drop objects in either hand. Stow Item: Flick appropriate controller down to stow away whats currently being held. Draw Item: Flick appropriate controller down to re-draw the last held object in that hand. Weapon A: Flick appropriate controller to the Left to draw your primary weapon in that hand. Weapon B: Flick appropriate controller to the Right to draw your Secondary weapon in that hand. Inventory Management: Using the Wiimote as a pointer and the A Button to grab items in your inventory to equip or rearrange. Inventory: Open / Close Inventory window. Quick Left / Quick Right: Scroll through quick access list. Quick Select: Use item selected in Quick list. Camera: Draw your camera for taking photos. Ammo Check /Reload Left / Right: Check ammo remaining or Hold to Reload weapon in appropriate hand. There are some issues in regard to the use of the Wii’s sensor bar, and i think some custom work will be needed to get the most out of it. The sensor bar is NOT required for general Wiimote use, as the Wiimote is just a bluetooth device and you only need a dongle and the appropriate software on your PC. The sensor bar however, is required for the Wiimote to “see” where you are aiming it. This is another reason why i’m doubtful of the Nunchuk’s ability to be used to control your left arm properly, i don’t know if the three-axis accelerometer will be enough. The sensor bar itself is nothing special, it’s just two infrared led’s that are positioned a certain distance apart, and the Wiimote then uses them to measure its distance and relative position. Now because the sensor bar is usually mounted on the top of your monitor / T.V, it’s possible there could be some accuracy trouble and movement restrictions when used with the Rift. This is because the sensor bar would remain stationary while you’re looking around with the Rift, so you would need to keep your body fixed towards the sensor, so you could aim the Wiimote at it. I have a good idea for a solution, but I’m not sure if it will work. 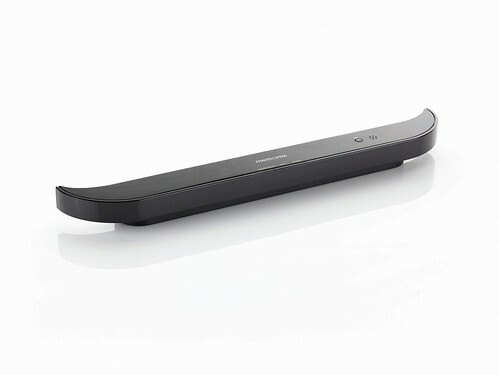 You could possible use a battery powered sensor bar and mount it to the top of the Rift headset, and then using an angled mirror that’s attached to the front of the Wiimote, you might be able to read the sensor bar position on your head. That way the Wiimote’s position will be relative to where your actually looking. This also allows you to be free to move around the room and not remain fixed on a certain position. Memorex Wireless Wii Sensor. Around $14-$15. I’m really not sure how well this setup would work, the angle and size of the mirror would need tweaking and it would no doubt take some practice to get used to it. I think given enough time and the right tools, a very attractive little slip on mirror could be made using perspex plastic, which would’t add much weight to the Wiimote and I don’t think it would cost much either, as most places would probably have some scrap perspex they could give you. Considering the sensor bar is battery powered and the Wiimote is bluetooth, its really only a matter of mounting the sensor bar with some tape, setting up the Wiimote drivers and your done. Providing the drivers can be integrated into Cryengine and the mirror set up works, this could be an amazing combo with little effort required on the users behalf. Who knows, if it was successful and became a popular control option among Rift users, a manufacturer might even start producing mirrors, or the Oculus people could provide a kit themselves! Dreamer.. You’re nothing but a.. Anyway, ill leave you with this info so i can get back to working on the island. I hope it gives you a bit more insight into what im thinking and what to expect from the controls. I will post more info later on about how to use your hands to operate doors, buttons and perform other tasks. I love the idea of being able to use motion control for at least one arm, each post seams to show even more that you are the perfect person for this job. Thank you for your amazing work so far and good luck with the alternative control ideas. The most important thing is that Crytek gets behind the Rift, otherwise the wiimote will have to handle both the free aim and head movement. With practice you will get good, but i think a mouse will be easier to control both actions, particularly for players used of a mouse. My priority will always remain with a solid mouse + keyboard setup, as its the way most people will play. I agree that mouse + keyboard setting should be a priority. This new technology is very perspective but it still needs some research and improvements. Besides it is pretty expensive and hard to get for many players. I like that little “mini-tutorial” of Anne taking a moment to familiarize herself with a gun before using it. Have you considered maybe making her fumble a little bit on each reload? Like, she can’t quite get the magazine seated in a single, fluid motion, and there’s an extra fraction of a second where she bumps it off the lip of the housing or something before getting it in. Or she has to flip her shotgun upside down so she can see where she’s putting the shells. It wouldn’t need to be extra time-consuming, just a slightly longer than average animation to make the reloading process a tiny bit slower than most FPSs. That way, Anne seems more like an average person, and it gives the player a reason to make every shot count, knowing that there’s that slow reload time. But that’s just my two-cents; don’t mind my rambling. 😀 Just keep doing what you’re doing. Sounds like you have everything planned out really well, and you’re doing an amazing job. Keep it up! The first time Anne tries to reload, it will take her a little while to work it all out. I think having her fumble a reload other than her first, would need to be in relation to what she is doing. Once someone has learned how to do something, they will naturally get better at it and eventually faster. I think there should be times when she is more prone to making a mistake and fumbling around more. Trying to reload while running or sprinting should result in a slower reload, as it would be harder to remove a clip, swap in a fresh one and you would no doubt have trouble inserting the new clip while your arms are swaying about. This would promote swapping between primary and secondary weapons as apposed to trying to reload in the middle of a confrontation. It would also ensure players reloaded between action and not run into a fight unprepared. I want variations to the animations, so that its not exactly the same reloading sequence every time. I also want to show that Anne is getting better at using the guns, but not in an obvious way using “level ups” or experience points. It could be done quite easily by having 3 or 4 different animations for reloading, some slower than others with a few fumbles, and over time increase the reload speed. That way it appears as if Anne is getting faster, but still with the occasional fumble. Eventually the slower animations can be used less and after a few hundred reloads, Anne is a pro, rarely fumbling. There’s always the possibility that reloading could be performed using motion or gestures, so that the faster and more accurate the player gets, then the faster and more accurate Anne gets. I quite like this whole idea you are portraying with the familiarization and fumbling (I realy missed a system like that a lot in Farcry 3, i read your opinion on that game. I must say i am on the same page as you are. Have you tried the realism mods yet, i can recommend those). Getting better at it and thus faster, it seems logical. And not in a Skyrim or Just Cause kind of way with progress bars and/or level ups. Only to be calculated in the back-end. Say for instanse, after 450 shotgun reloads you are the fastest with that kind of gun. This could be made randomized so each new game the game will choose from a range of say 440-460. Then it well never be 450 all the time. We should talk Diminishing returns here, otherwise someone with a lot of shells could max his skill what a shotgun very easily. The free aiming and recoil concept video, it just oozes traspasser. It really gives you that connected feeling like you are in there, realy immersive. Other than the majority of FPS games where you are a floating gun platform. Now the Rift, don’t get me started. It’s an awesome piece of future technolgy. I’m a fan of Carmack’s work (ok Rage fell short but Carmack’s work on it was very innovative) and i very much like the fact he is pushing this technology, much like he did in the past with other stuff and he still does with Armadillo Aerospace. You said it earlier, pushing the technological envelope on this project has become more and more of a focal point (not that you said it literally, i just interpreted this way). With that said, the Rift fits nicely in a project like this (only if Crytek adopts it offcourse). Pushing hardware like Trespasser did many years ago! Playing Trespasser with a Wiimote is a thing i would very much like to do. Moving Anna with the Nunchuck, manipulating her arm with the mote and doing all kinds of gestures. And using it while playing your remake for that matter. Sold! Say when people play with the Wiimote and without the Rift could ther still be the possibility of head tracking? You probably know that Johnny Lee video from 2007 where he did a head tracking prototype with a Wiimote. He demonstrated you could wear safety glasses with LED’s on the sides for tracking. Two years after that a couple of students used another method of mister Lee, the ‘finger tracking’ for head tracking purposes. With a little reflective surface on your head. Here are the respective video’s. Allthough i like the concept i recon it can be easily done with a modern webcam and some software. So no playing dressup when visiting Site B. One thing you mention a lot in this piece is the controllability of both the arms. I have put some thought in this matter, it may freshen up your ideas. It may sound less ambitious but hear me out. Instead of focussing on making both arms work you could opt for a ‘leader’ and ‘follower’ arm. I will try to explain this along the lines of adding a left arm to the original Trespasser. Say Anne is a right hander (like we have come to know her for) then when she holds a melee weapon like a bat both the hands are allways on the same spot (grip points) of the bat. Right hand above left. When swinging she uses both hands, but can still pick up stuff with her left hand(follower) while holding the bat in her right hand(leader). When she tries to pick something up while holding a weapon of any kind, you control the left arm in the same manner we come to have known from her right arm al the time. This could allso go for Wiimote controls. Have a bat equipped, press a button which enables manipulation of the left arm, point the mote at the screen and the left arm moves (the right arm stays in a default position). Weapons like a baton (on hander melee weapon) and a pistol have a little more freedom this way, compared to the bat (two hander stronger blows but more time between hits). You can hold other stuff in your left hand now. Then again when your left hand is free of stuff/items and you have a pistol equipped in your right hand, the left hand it could grip the pistol aswell for better aiming (recoil) compared to having a pistol and another item in your left hand. The same goes for, say an AK (or any other rifle for that mattter). The left arm follows the right and steadies the gun. I think you should be able to hold a rifle in your right hand and carry something in your left. But for ‘realism’ sake this should greatly increace recoil. By default you use the right arm unless you have something equipped. This may sound cheap but i real life it is not that much different. Still you can choose to have a button which switches the controls, so when the player choses to use the left instead of the right arm they are able to. Personally i don’t think you like this approach, since i have seen how meticulously you plan and try to execute everything. But im glad if this idea gave you some new inspiration. Cheers and offcourse, keep up the good work. Btw i will drop something off for you in the next week. The controls are something that will need testing in order to get right, but i think for the time being the system i have come up with provides the best compromise between the original arm and having an additional arm. I think by removing the rotate wrist and rotate arm controls, it simplifies things and puts an end to any confusing glitchy arm behavior. Then by prioritizing the Throw, Stow, Pickup/Drop commands to the left hand, it allows quick interaction with objects and items while staying armed. I didn’t want to add additional controls, and this system uses one less than Trespasser did, but provides much more control. Not being able to rotate your arm or wrist wont be an issue either, because in the original game the gun sights were always lined up when you first picked them up. You will be able to hold the Move Arm command to aim the gun around within the screen space, and when you try to aim beyond the screen, your view will follow the hand. If you point the gun off to the side and release the Move Arm key, the gun will remain pointed in that direction. The only aspect im not 100% sure about is the function of the Move Arm key when using melee weapons. I kind of like the idea that it simply adjusts the arc of your swing from a right to left swing to a downward swing, or the opposite if you have your left hand set as the preferred hand in the game options. The ability to use the Move Arm key to swing an object around as a melee weapon was never any good in trespasser anyway, so here it will probably be only good for nudging doors open with your gun, tapping a button, or maybe breaking a window. Moving a rock around might only be good for clearing up your view a bit. There will be two-handed controls for larger objects too, so if you walk up to a barrel, you can simply press F (grab/drop) to pick it up with both arms, as you do in Crysis. 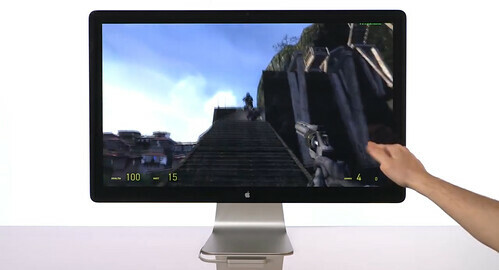 Then, either of Move Arm keys will allow you to position it on the screen for a clearer view and to help with stacking. If you use just one arm, it allows you to grab it from one point and drag it or push it over. Handy for pushing a barrel over a ledge while remaining armed, or even more amusing, you could drag/pull a plank out from under a pursuing dinos feet, causing it to fall into the gap you just crossed. Im really just focused on Keyboard + Mouse controls and thats it for now. The Leap is not a priority, neither is the Rift, as they are just nice accessories. 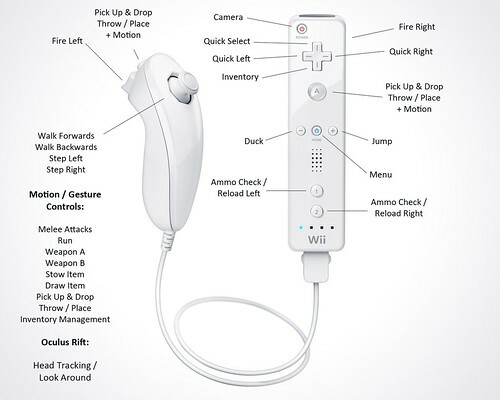 I would love to have Rift and Wiimote controls, but i want to focus on what everyone will have first. The implementation of Rift support is something i’ve been thinking about lately, and i think it could be done via a custom shader distorting the view to counter the Rift’s fisheye effect. As long as the input of the Rifts movements could be detected, then there wouldnt need to be any serious hardware implementation and support from Crytek. There are already shader hacks that allow 3D in Crysis, i dont see why it wouldn’t work here too. Like i said though, this is all just theory until some in-game testing begins. All im waiting on is someone whos experienced in programming or working with the CE2 flowgraph to offer their help, and we can begin. Blog update coming soon, thanks again for your comments and ideas, much appreciated!